This light weight advanced oil free formula contains Sandalwood,Vitamin A,C & E and other precious botanical herbal extracts that penetrates deep into the skin to induce visible radiance to skin. 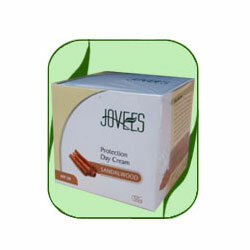 It Builds moisture barrier that protects skin from the harmful effects of sun rays and shields skin from tanning. Its skin texture renewal properties help to reveal fairer, smoother and clearer complexion. Apply a small amount into areas of face and neck. Leave on. May also be used as a base for make up. Carrot extract, Aloevera ext, Lemon extract, Almond Oil, Sandalwood, Liquorice, Jojoba Oil Extract.